I have been selling Barefoot Books for over a decade – in fact my book selling career started when I became a direct seller for Barefoot Books. I was impressed by their books for many reasons. At a time when multicultural books were almost non-existent, all their books were diverse. The artwork was beautiful and engaging. The language was rich and embraced global messages. Their books continue to deliver which is why I am still selling them as a children’s bookseller. 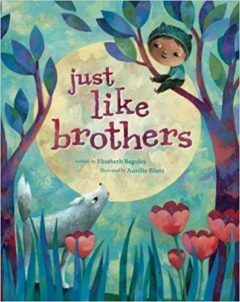 Just Like Brothers is the latest release from Barefoot Books and it is a gem. There is so much to love about this book! The author is very playful with language coupling words to create her own new words. For instance, she describes the woods in the story as “…tree-thick and thorny-twisty.” Immediately a vibrant picture pops in the reader’s mind. There is not a lot of text on each page and the text is large and easy to read. The illustrations are colorful and playful. The messages drawn from this book are timeless: empathy, respect, tolerance, integrity, curiosity, independence, friendship, courage and being open-mined. This book is a perfect spring-board for so many important discussions to have with children. The characters in the book are a wolf mother and her cub and a human mother and her child. Each mother warns their off-spring about the dangers of the other species. Of course, the paths of the cub and the boy cross. They think about what their mothers told them. However the reality in front of them is very different – and they both enjoy chasing rabbits. So they put away their fears and their mothers’ warnings and play together. This says so much about stereotyping. How meeting one on one and getting to know each helps us see how much we have in common. And that our differences make us unique, but not enemies. I received a review copy from Myrick Marketing & Media, LLC / Publisher Spotlight. IB Ties/Emotional Intelligence: empathy, respect, tolerance, integrity, curiosity, independence, friendship, courage, being open-mined.